The Greatest Road Trip loves to be back on the road, this time to the history-laden state of Massachusetts. The cradle of American freedom Massachusetts (known as “Mass” to the locals) is a mixture of urban class and rural cool. It is seashore, forests and people passionate and parochial about the local sports franchises. It was a strong stock of folks who landed on the coast of Massachusetts and pulled themselves ashore by grabbing Plymouth Rock. It is a hearty stock of people still who brave the elements of winter chill and summer heat to make Massachusetts home. First the British, then the Irish and later the Italians migrated across the North Atlantic to have a go in the new world. Their descendants live on in New England. Contrary to Bostonian popular opinion, the entire revolt against Great Britain wasn’t played out in Massachusetts. It is the truth, though, that most of it was planned there. Massachusetts is bordered by the Atlantic Ocean to the east, New Hampshire to the north, Vermont to the northwest and New York State to the west. Connecticut and Rhode Island jointly share Massachusetts’ southern border. Massachusetts is the sixth smallest state in the Union but has the 15th most residents. Therefore, it ranks as one of the truly urban states we have visited thus far. It is 183 miles from west to east and 113 miles north to south. The surprisingly long east-west reach is because of the stretch of capes off Massachusetts’ eastern shore. 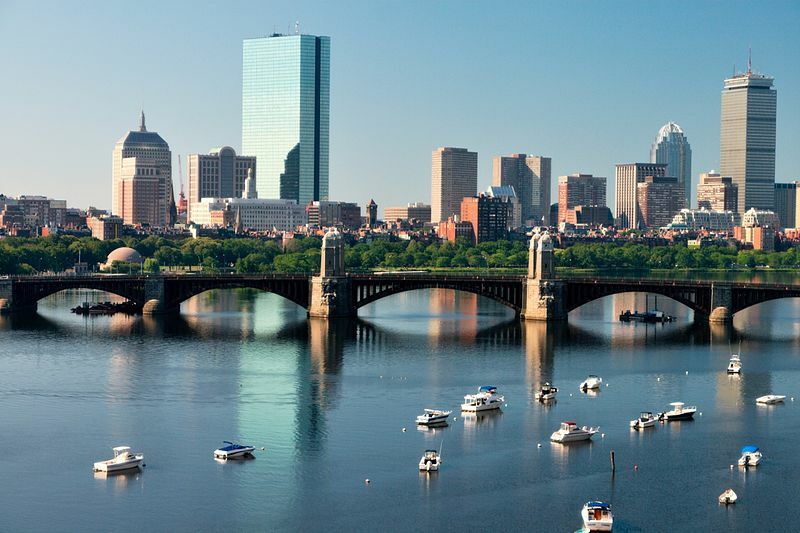 The capital of Massachusetts and the state’s largest city, by far, is Boston. Worcester, Springfield, Lowell, and Cambridge join Beantown in a list of cities exceeding 100,000 in population. The state’s lowest point is the Atlantic Ocean, and highest point (3,489 feet) is atop Mount Greylock, near its northwestern border. The geographic center of Massachusetts is in the town of Rutland. There is a tree planted there marking the spot. Eastern Time Zone from stem to stern, Massachusetts observes Daylight Savings Time. Worcester Regional serves a little more than 50,000 passengers a year. Ft. Lauderdale and Orlando are the major destinations. Nantucket Memorial enplanes about 170,000 passengers annually. Boston and New York share most frequent destination honors. The TV show “Wings” was supposedly set at this airport. Boston’s Logan International flies over 15 million passengers a year. Chicago is the most common destination. London is a very popular international destination from this major eastern seaboard airport. Presidents: John Adams, John Quincy Adams, George H. W. Bush, and John Kennedy. Military/Politics: Benjamin Franklin, Paul Revere, John Hancock, and Samuel Adams. Actors: Jack Albertson, Misha Collins, Mark Wahlberg, G. Hannelius, Chris Evans, Bette Davis, John Krasinski, Matthew Perry, Steve Carell, Ellen Pompeo, Matt Damon, Leonard Nimoy, Matt LeBlanc, Amy Poehler, Uma Thurman, Elizabeth Banks, and Ella Raines. Entertainers: Cecil B. Demille, Rachel Platten, Lil Poopy, Acacia Brinley, Jason Nash, Meaghan Trainor, Lyndsey Gunnelfsen, Bobby Brown, Brian Evans, Jo Dee Messina, Nicky Jam, Conan O’Brien, Bo Burnham, and Leonard Bernstein. Authors: Horatio Alger, Henry David Thoreau, William Cullen Bryant, e.e. cummings, Emily Dickenson, Ralph Waldo Emerson, Nathaniel Hawthorne, Oliver Wendell Holmes, Theodore Geisel (Dr. Suess) and Edgar Allen Poe. Athletes: John Cena, and Aly Raisman. The Salem witch trials of 1692 were real. The documents concerning them are stored in the Peabody Essex Museum. The first subway system in the U.S. was built in Boston in 1897. It is still one of the cleanest and safest such systems in the world. There is a house in Rockport made entirely of paper. The Fig Newton was named after the city of Newton. Massachusetts is one of the few states with an official polka. “Say Hello To Someone From Massachusetts” by Lenny Gomulka is it’s name. Harvard, located in Cambridge, was the first college in North America, established 140 years before the American Revolution. The Mather School was founded in Dorchester in 1639 (three years after Harvard opened its Ivy-covered doors.). It is the first public elementary school in America. The sport of volleyball was invented in Holyoke in 1895. It was originally called Mintonette. Hingham’s Derby Academy founded in 1784 is the oldest co-ed school in the United States. James Naismith invented basketball in 1891. He was teaching at the International YMCA Training School in Springfield then and needed a wet-weather physical education activity. The Boston Tea Party reenactment takes place in Boston Harbor every December 16th. Revere Beach was the first public beach in the United States. It hosts Suffolk Downs horse racing track, Wonderland dog racing track, and a 14-screen cinema complex. Shelburne Falls is our first stop. Here we will find the Bridge of Flowers. Once upon a time, there was a trolley line which fell into disuse. Rather than tear it down, the city of Shelburne decided to plant it with flowers and make it beautiful. It is an excellent way to start our trip. Eastward we go. Halfway across the state, find Auburn and Crystal Caves Family Fun Center. Just challenging enough for adults and little ones alike, Crystal Caves offers miniature golf, batting cages, and some of the best ice cream in New England. We’re going to stay a few miles east of Auburn at The Grafton Inn for $90 a night. Beantown is up next! Boston is one of the cities The Greatest Road Trip Ever Taken has been most anxious to share with you. That’s one reason we stayed in Grafton last night. We wanted to get a jump on Boston! The capital of more than Massachusetts, Boston is really the capital of New England. It’s home to sports, culture, and more history than just about anyplace in the world. Let’s start with culture. We are going to enjoy an evening with the Boston Pops. They offer something musical for everyone in a beautiful and intimate setting. Music lovers need to see the Pops, and musicians don’t have a choice. They simply must see them. The Boston Pops are a world-caliber orchestral ensemble playing a mix of classical and standard music. Adding to the experience, they play in one of the top three acoustically best concert halls in the world. We will order a snack and/or a bottle of wine and allow the music to transport us. Who started the standing ovation? Oh! It was us! Do you like sports? Of course, you do, because we liked you from the beginning of the trip. No matter the season, Boston has a passionate sport following ready to carry you along for the ride. The Red Sox in the spring and summer at historic Fenway Park. The Bruins or Celtics at the new Boston Garden (now called TD Garden, but it will always be Boston Garden to us.) In the fall take a half hour trip south to Gillette Stadium and see the Patriots. Now for the historic portion of our journey, because we saved the best for last. Today we will follow The Freedom Trail! There are two ways of going about it. We can have a tour guide for about $15. From the knowledgeable guide, we will learn the most we can learn. However, a self-guided tour is fun if we want to spend however much time we need at any one place. The trail is marked in bright yellow and we will learn a ton, no matter which way we choose to tour. What will we learn? We have heard about the Boston Tea Party, but it will seem much more real when we see how and where it took place. After that, we’ll check out The Old North Church. Along the way, we will find out how and where the Revolution was planned. (Did you know our country was founded in taverns? It’s true.) The trail ends at Bunker Hill. It is one of the most informative and entertaining two or three hours we will spend on the entire trip. To do Boston right, we will need at least three or four nights. We are staying at the Newbury Guest House for $239 a night. Massachusetts was a beautiful state to visit, and Boston is one of our favorite cities in the world. We knew you would agree on both counts.